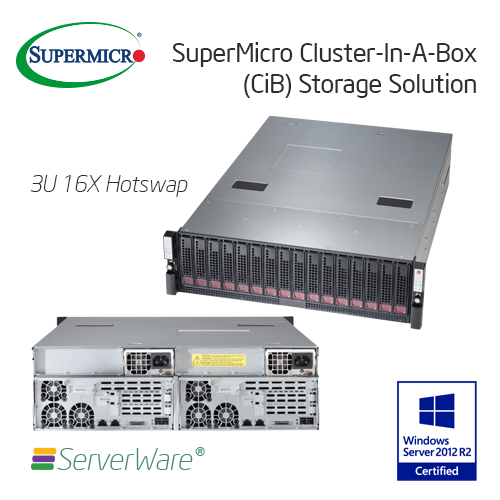 Supermicro’s 3U SuperStorage Bridge Bay running Windows Storage Server 2012 R2 Standard is a fully redundant, fault-tolerant Cluster-in-a-Box designed for mission-critical, enterprise storage. • Hot-swappable modules for all active components – including storage controllers, power supplies, and disk drives. 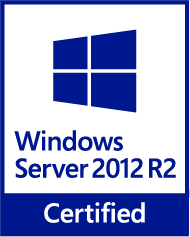 • Ready-to-deploy – delivered with Windows Storage Server 2012 R2 Standard preinstalled and Failover Clustering preconfigured across the two compute nodes. • Native integration with Active Directory – enabling fast and easy deployment in existing Windows Server-based IT infrastructures. 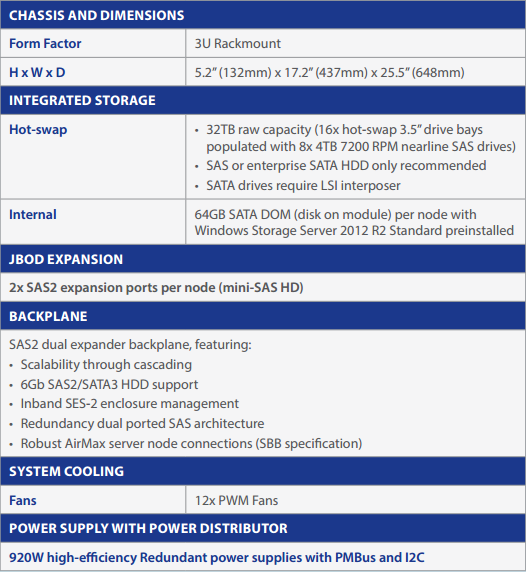 • Easily expanded – built-in expansion ports make it easy to connect up to four Super SBB 937R-E2JB JBODs, each of which supports 16x 3.5” SAS2/SATA3 drives. • Data Deduplication and Storage Spaces – for maximizing and scaling your storage capacity. 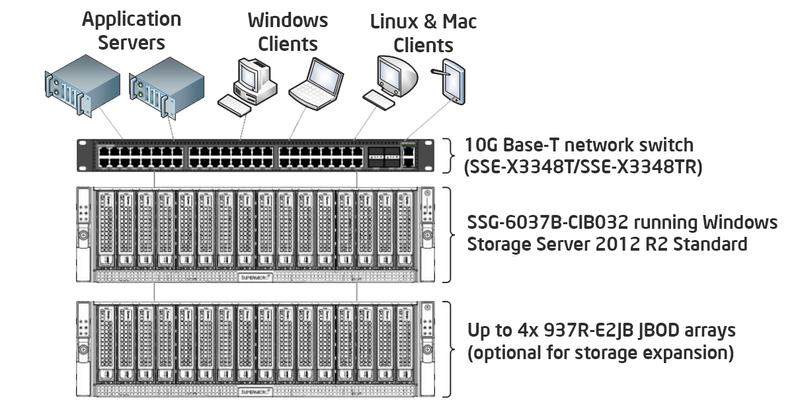 • Storage Tiers, SMB Direct, SMB Multichannel, and NIC Teaming – for maximum performance. • Enhancements to Failover Clustering and Hyper-V – for improved reliability. The following diagram shows a typical deployment model for the SSG-6037B-CIB032 running Windows Storage Server 2012 R2 Standard in a datacenter environment. The use of Data Deduplication in Windows Storage Server 2012 R2 Standard can provide a significant increase in storage efficiency for many common storage workloads. 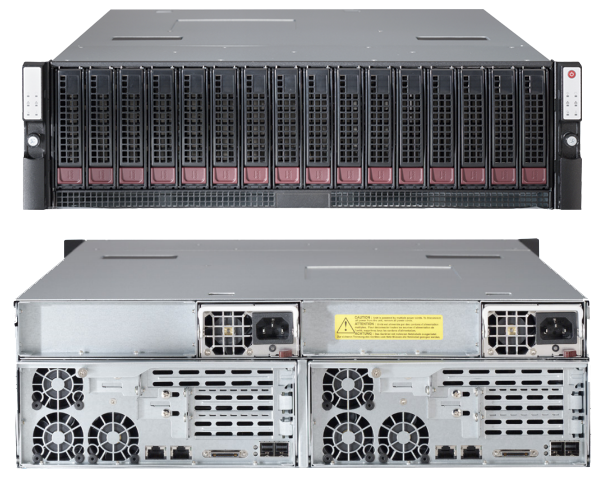 After maximum capacity is reached, the SSG-6037B-CIB032 can easily be expanded by connecting its built-in JBOD expansion port to a Super SBB JBOD (Supermicro P/N SYS-937R-E2JB), which supports 16x 3.5” SAS2/SATA3 drives. Up to four JBODs can be attached, providing up to an additional 384TB of raw disk capacity when populated with 6TB nearline SAS drives. 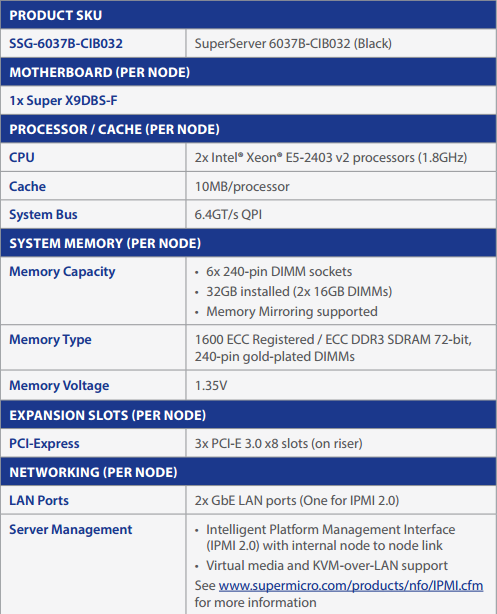 ServerWare® provides advanced hardware systems to cloud datacenters worldwide. Product lines include servers, storage, network switches, and integrated rack systems. ServerWare® customers want the same innovative cloud hardware technology in use by hyperscale cloud datacenter operators, but in off-the-shelf SKUs with global services. ServerWare® sells cloud hardware that delivers hyperscale performance, efficiency and advanced engineering, with flexible product configuration, rack integration, performance tuning and engineering consulting services to help customers deploy optimized cloud solutions for their unique cloud workloads. ServerWare SG13SE. First Server Ownership Campaign. © Copyright 2003-2015 ServerWare Sdn Bhd. All rights reserved. ServerWare® and Every Server Has A Story™ are Registered Trade mark of ServerWare Sdn Bhd. All other registered trademarks are properties of thier respective owners.